"We're gonna win Twins, we're gonna score!" 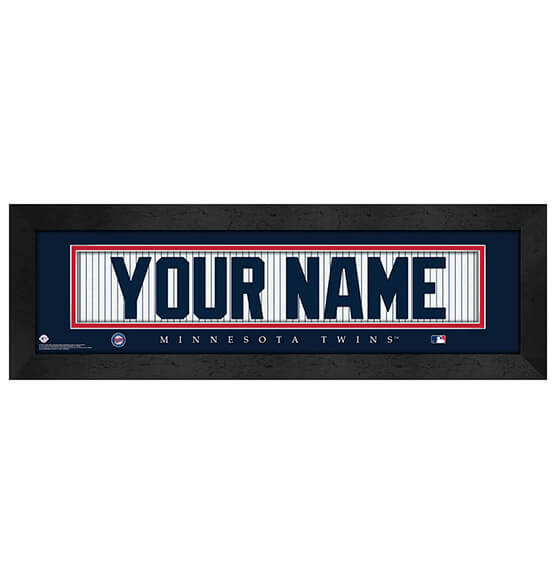 Be part of the legendary Minnesota Twins franchise with our Personalized Minnesota Twins Framed Nameplate, custom-made with your specified name up to 12 characters. Whether you create this custom nameplate for yourself or another Twins fan in your life, one thing is for sure: this piece will be cherished for years to come. Perfect for any fan cave, our Minnesota Twins nameplate comes ready to hang using the attached sawtooth hanger. It features vibrant team colors and team logo, a sleek black frame and a premium-quality print behind glass. Show your Twinkies spirit with this MLB sports decor! Print measures 6" by 22"